Going to start with my credentials. 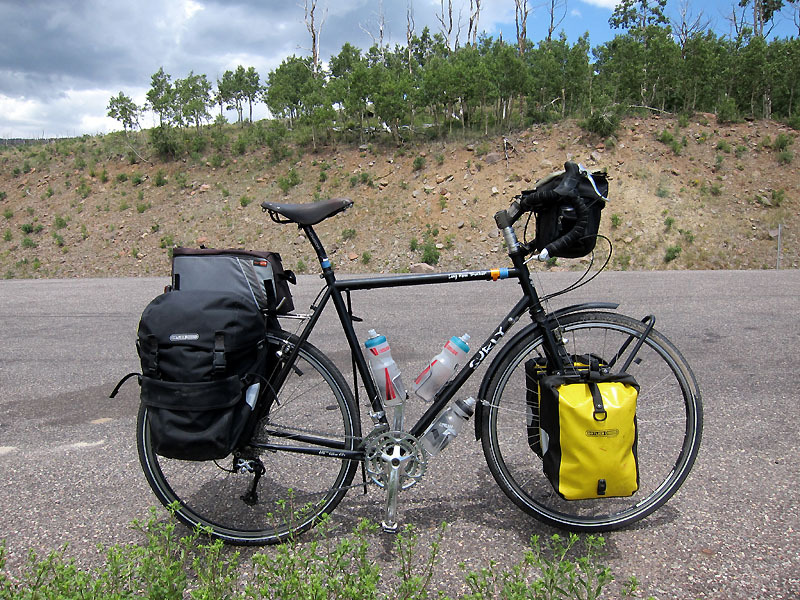 I’ve owned a Surly Long Haul Trucker for 5 years now. 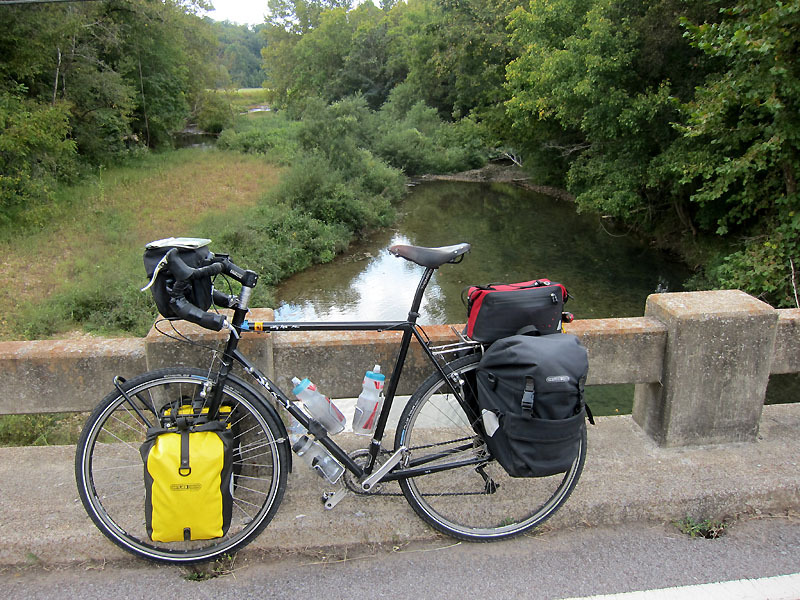 In that time I’ve put 18,700 miles on it, about 8,500 of them with fully loaded panniers. I also regularly use it for grocery shopping and errands around town. So if you are seeking a solid user’s experience, you’ve come to a good place. What’s to like…? Impeccably strong construction and good materials. The Cr-Mo steel frame is comfortable and has a relaxed geometry that stretches it out just a little. I had to get used to the slightly longer distance between handlebar and seat, and played around for a couple months with handlebar spacer rings. After 6 months, I was so comfortable on this bike I stopped riding my road bike completely. The bike comes with rugged Shimano Tiagra (front) and XL (rear) derailleurs that are basically standard mountain bike equipment. That means gearing is very wide, a little clipped at the high end (where you hardly ever need it), and parts are available everywhere. 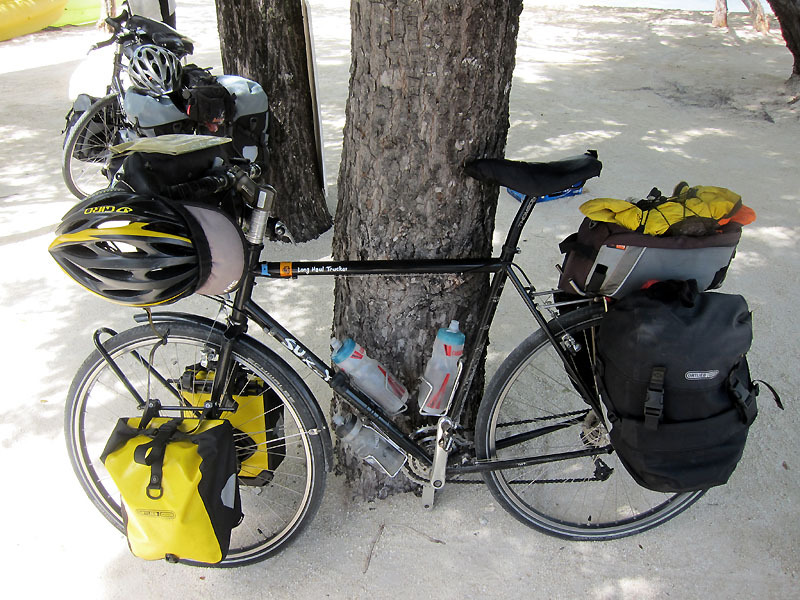 Stock Continental Contact tires are comfortable, but I prefer riding Schwalbe Marathon Duremes or Plus Tour, primarily for the extra durability. Brakes have been reliable. I’m currently on my 4th set of brake pads. The frame finish is extremely durable and resists scratching very well. I’ve got a few dings that have broken through the paint, and find the Cr-Mo steel resists (although is not immune) to rusting. Braze-ons are everything you ever want. Three sets for water bottles – standard. 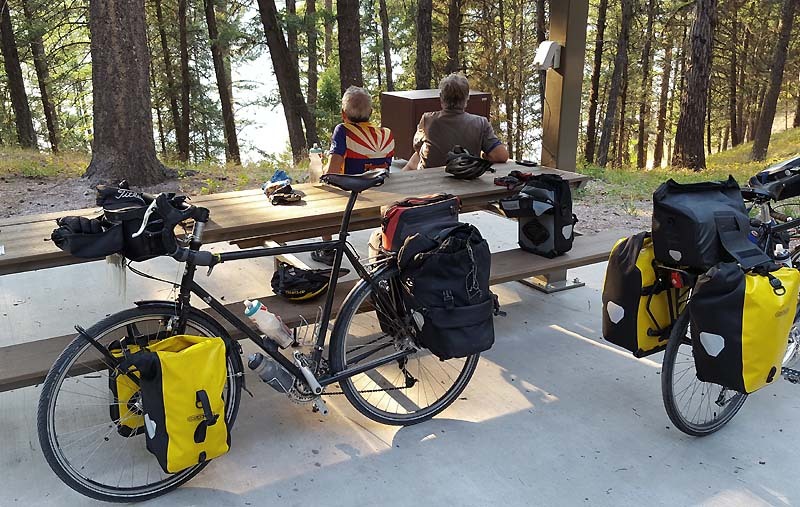 Full sets for front and rear racks – standard. Brazed-on “rack” for 2 spare spokes on the rear stay – standard. There’s even a brazed-on peg inside the right rear drop where you can hang your chain when the wheel is off. Riding this bike is very best part. Effortless miles. Easy miles. Long Haul Trucker – the name is right on target. Amazing stability in carrying loads. Stability – going 50 mph loaded down a mountainside. 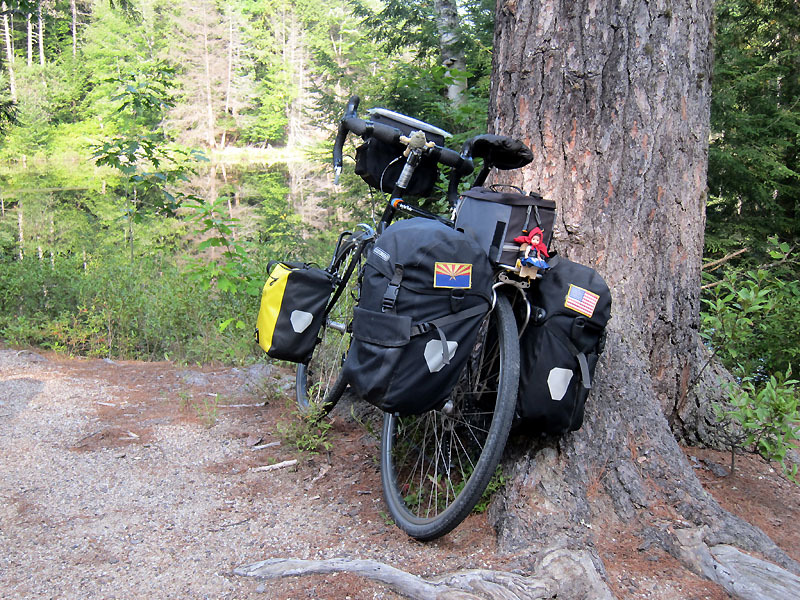 Stability – doing 3 mph loaded up a steep gravel grade. I almost forgot to mention comfort. Riding this bike is like wearing an old shoe. The steel frame and larger tires (I run 32mm or 35mm) absorb road roughness with real grace. Anything I don’t like…? Wow, I’m trying to come up with something, if only to appear balanced. OK, the stock seat is not great, which Surly knows you’re going to replace. I installed a Brooks B-17 from the beginning and love it. After a year or so I also replaced the seat stem but can’t recall specifically why. The frame decals are wearing off the frame. Now, 6 years in, they’re almost completely gone, with the last little bit of white flaking away. Think badge of honor. Nope, can’t think of anything else. I like everything about this bike. What’s needed repairing…? I’ve replaced tires and brake pads, of course. One spoke. I think I’m on my 3rd rear cassette and my 3rd chain. Note, I only weigh 165 pounds and almost never mash the pedals on this bike. In year five, the main spring fractured on the Shimano Tiagra front derailleur, requiring derailleur replacement. On a long tour, I accidentally got electrical tape adhesive gummed up into the handlebar shifters, which has muffled the indexing. Both shifters now feel like analog shifters, but still work perfectly. I’d compare almost all my friends’ road bikes to Ferraris. That’s what seems to sell in America. 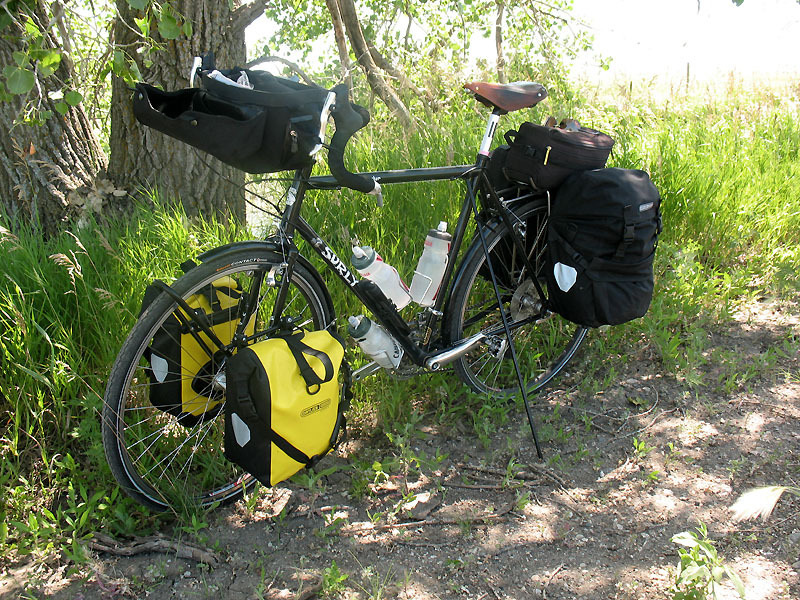 The Surly LHT is a pick-up truck. Super useful. Super comfortable. Super durable. I can’t believe I only paid $900 brand new for this machine, and the prices actually haven’t moved up much at all. This bike is a true joy to own. One of the highest value purchases I have ever made in my life. If President Obama knew about this bike, he’d offer a tax incentive to owners. We’d soon end our dependence on foreign oil, and we’d vastly improve the health insurance quagmire, too. That’s how good this bike is. September 2017 – A short update, although nothing has changed – I think the world of this bike. Jack and Phil also own LHTs would likely agree. 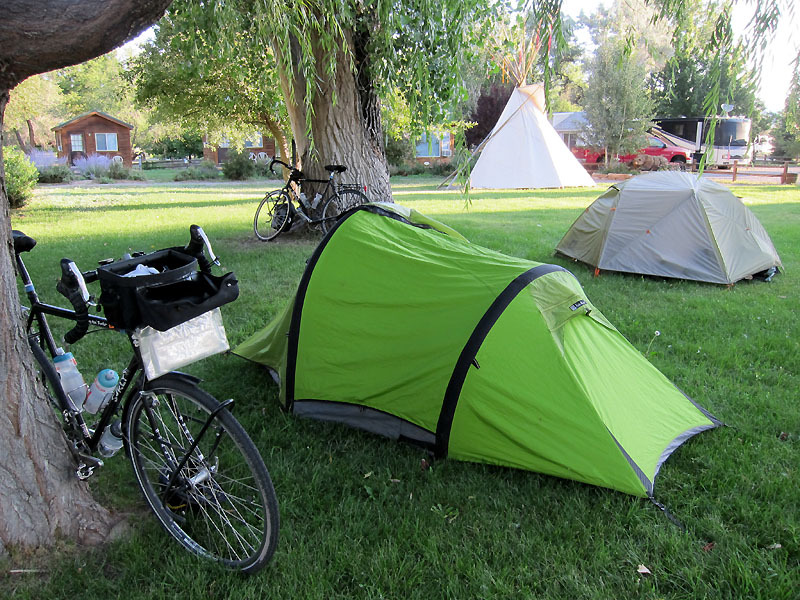 My Surly now has 21,150 miles on it and going strong.